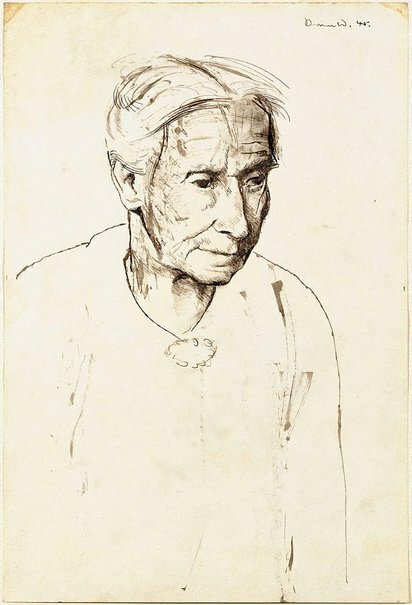 'Head of a woman' is a remarkable portrait by Donald Friend, made after a period spent in the army during World War Two, a time when he re-directed his work towards realism. Friend's objective and dispassionate observation of his subject has resulted in a sensitive and revealing image of dignified old age. There are over thirty drawings by Friend in the Gallery's collection. Signed and dated u.r., pen and brown ink "Donald. 45.". Elizabeth Cross, Look , 'On drawing', pg. 22-27, Sydney, Aug 2005, 27 (colour illus.). Lou Klepac, Donald Friend: a charmed life , Canberra, 2006. Checklist of works. Anne Ryan, Look , 'Drawing it all together', pg. 28-29, Heidelberg, Dec 1997, 28 (illus. ).